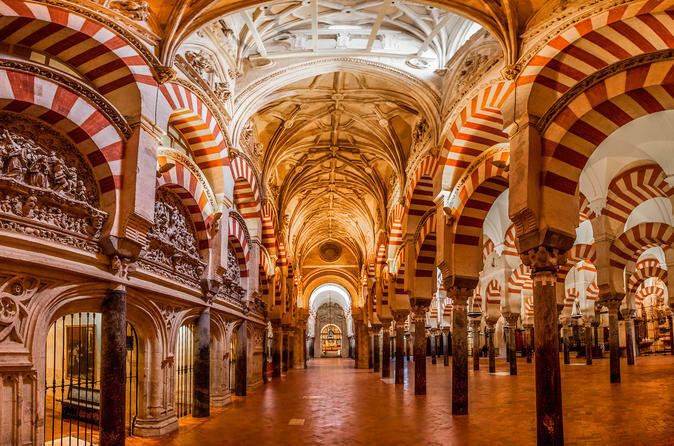 Local visit in Lisbon, Cordoba, Seville, Fes, Rabat, , Granada and Toledo. Delux motor coach with WIFI connection. Departure from our bus terminal at 08:00 a.m.towards the region of Extremadura and arrival toTrujillo, Freetime to know its beautiful and monumental PlazaMayor. Continuation to Lisbon, the capital of Portugal located at the mouth of river Tagus. Accommodations. Optional night tour to attend a show of Fado, typical Portuguese music. Breakfast and accommodations. Morning city sightseeing tour: free afternoon. Optional excursion to Sintra, Estoril, Cascais. Breakfast. In the morning departure to Fatima, important center of pilgrimage. Free time to visit the Shrine. Return to Lisbon. Accommodations. Breakfast. Departure to Caceres. Time at leisure to know its Plaza Mayor and to walk through the old city and its famous Mdieval quarter, Lunch at your own. Continuation to Cordoba. Dinner and accommodations. Breakfast. Sightseeing tour visiting the famous Mosque-Cathedral and Jewish Quarter. Departure to Seville. Lunch. Afternoon at leisure. Accommodations. Half board in the hotel. Morning city tour. Optional artistic tour including the Royal Alcazar Palace. Afternoon at leisure to continue discovering the city. Breakfast Free time. Dinner and accommodations. and, after customs, continuation to the imperial city of Fes. Dinner andaccommodations. and its narrow streets, quarter of tanners, thefountain Najerine, the great Medina, World Heritage site. Afternoon at leisure. Breakfast. Departure to Meknes. Panoramic tour of this imperial walled city and continuationto Rabat, capital of the Kingdom of Morocco. Breakfast. Departure to board the ferry and cross back the strait towards Spain. Dinner and accommodations. Breakfast and departure towards the Imperial City of Toledo, full of history. Lunch and city sightseeing. Continuation to Madrid. Arrival and end of the services.